Opponents need 2 additional success tokens to win attached story. "He held up his hands. 'I'm afraid you're two credits short of graduating. There's nothing I can do.'" 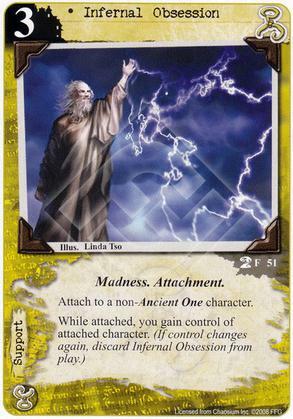 Play only if every character you control has the [Yog-Sothoth] affiliation. 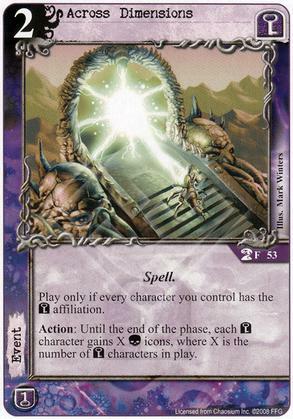 Action: Until the end of the phase, each [Yog-Sothoth] character gains X (C) icons, where X is the number of [Yog-Sothoth] characters in play. Play during your story phase, before characters are committed to stories. 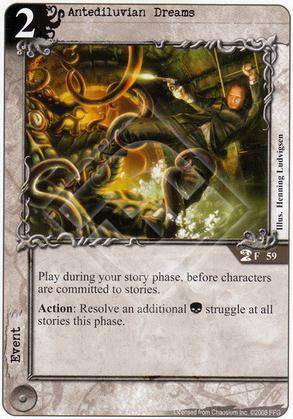 Action: Resolve an additional (C) struggle at all stories this phase. 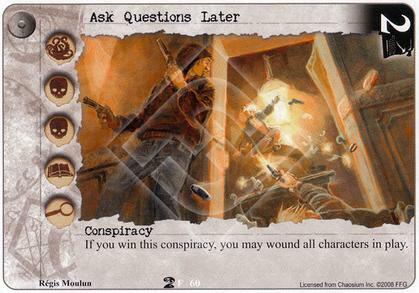 If you win this conspiracy, you may wound all characters in play. 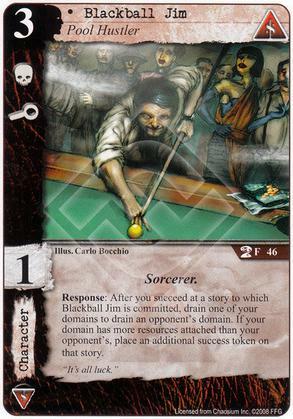 Response: After you succeed at a story to which Blackball Jim is committed, drain one of your domains to drain an opponent's domain. 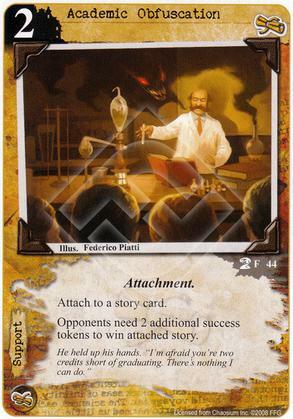 If your domain has more resources attached than your opponent's, place an additional success token on that story. 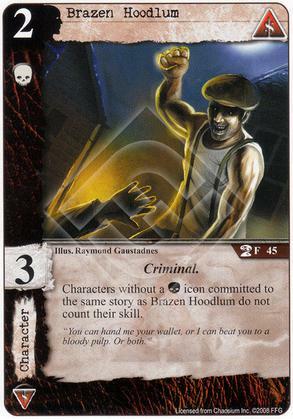 Characters without a (C) icon committed to the same story as Brazen Hoodlum do not count their skill. "You can hand me your wallet, or I can beat you to a bloody pulp. Or both." 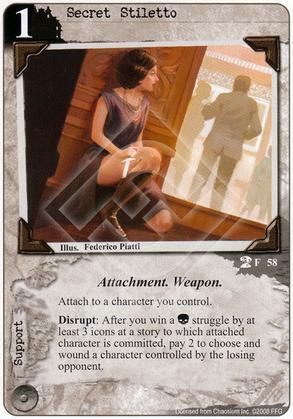 Attach to an [Agency] character. Action: Discard Dynamite from play to wound all characters committed to the same story as attached character. "So, this is what they mean by 'Pulp Horror'?" 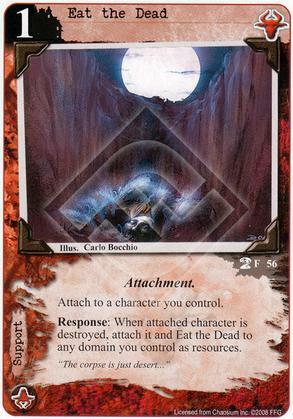 Response: When attached character is destroyed, attach it and Eat the Dead to any domain you control as resources. 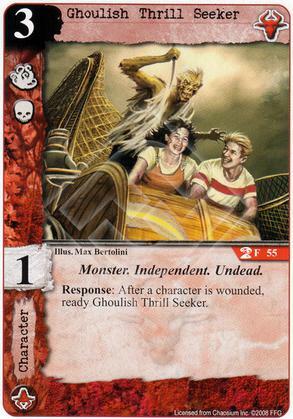 "The corpse is just desert..."
Response: After a character is wounded, ready Ghoulish Thrill Seeker. 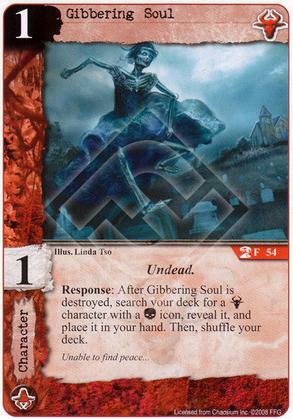 Response: After Gibbering Soul is destroyed, search your deck for a [Shub-Niggurath] character with a (C) icon, reveal it, and place it in your hand. Then, shuffle your deck. 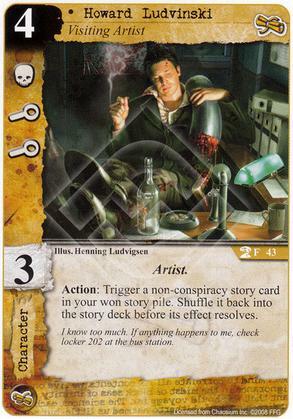 Action: Trigger a non-conspiracy story card in your won story pile. 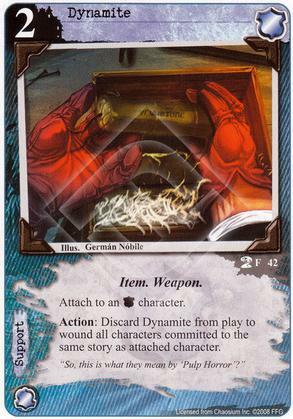 Shuffle it back into the story deck before its effect resolves. I know too much. If anything happens to me, check locker 202 at the bus station. 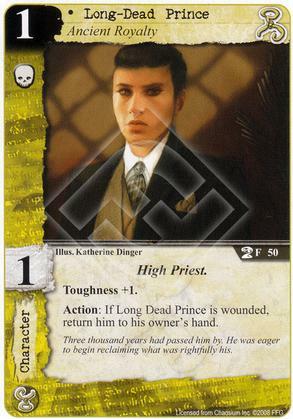 Action: If Long Dead Prince is wounded, return him to his owner's hand. Three thousand years had passed him by. He was eager to begin reclaiming what was rightfully his. 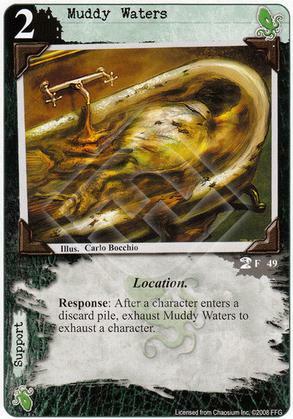 Response: After a character enters a discard pile, exhaust Muddy Waters to exhaust a character. 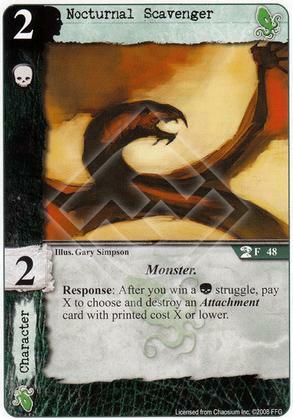 Response: After you win a (C) struggle, pay X to choose and destroy an attachment card with printed cost X or lower. 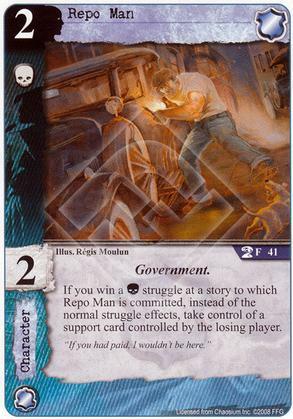 If you win a [Combat] Struggle at a story to which Repo Man is committed, instead of the normal struggle effects, take control of a support card controlled by the losing player. "If you had paid, I wouldn't be here." 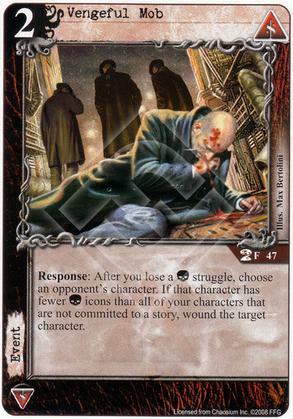 Disrupt: After you win a (C) struggle by at least 3 icons at a story to which attached character is committed, pay 2 to choose and wound a character controlled by the losing opponent. Disrupt: After you win a (C) struggle in which The Cornered Man participated, wound The Cornered Man to immediately resolve another (C) struggle at that story. His only option was to fight like never before. 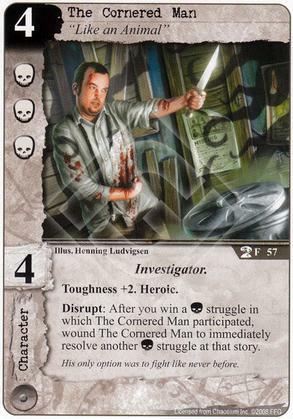 Response: After The Sleepwalker commits to a story, choose an opponent's character with a C icon. 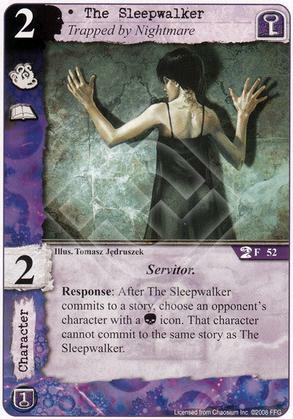 That character cannot commit to the same story as The Sleepwalker. Response: After you lose a (C) struggle, choose an opponent's character. If that character has fewer (C) icons than all of your characters that are not committed to a story, wound the target character.